After seeing some small gains during yesterday’s trading session, prices are headed lower across the board. Crude picked up a meager 14 cents yesterday, but gave up those gains and more overnight. Currently, crude prices are trading at $56.84, 78 cents (1.36%) below yesterday’s close. Diesel markets also picked up a nearly 2 cents on Tuesday to close at $1.9139. Today, diesel prices are on the downward mend, propelled by a larger than expected diesel stock build. Prices are currently trading at $1.8943, down 1.96 cents (1.02%). Gasoline prices also strengthened yesterday, gaining a significant 2.5 cents. Prices closed at $1.7184 despite a reported stock draw. However, like diesel, gasoline prices are headed lower this morning, currently down 1.85 cents (1.08%) to $1.7730. 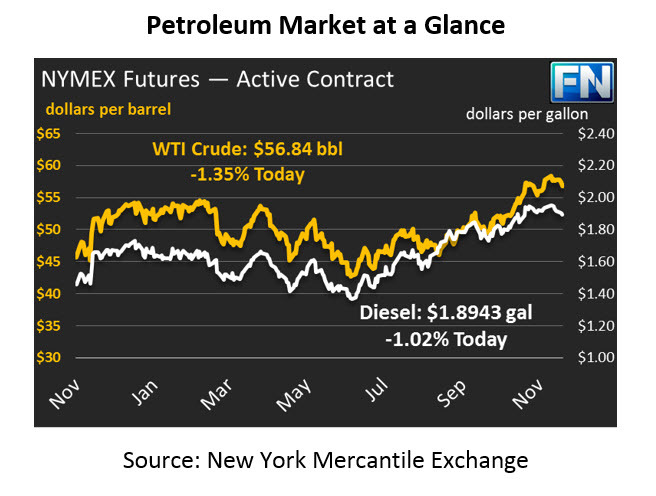 The API’s report was quite a surprise for the market, reporting massive inventory builds for both gasoline and diesel and larger than expected draws for crude. The report showed a build of 13.5MMbbls in combined product inventories with increases of 4.3MMbbls and 9.2MMbbls for diesel and gasoline respectively. Confirmation of these builds could weaken prices significantly, as prices are already feeling the effects of the report this morning. API reported a draw of 5.5MMbbls for crude inventories last week. Declines are mostly a result of the Key Stone pipeline closure which has taken product off the market over the past few weeks. If the EIA confirms these draws, U.S. crude inventories would fall their lowest level since October 2015. The market is anticipating the EIA report that will be coming out shortly to confirm API’s bearish news.